With each new album release, musicians tend to get a ‘best yet’ nod in print. As more music is written, and bands tour non-stop to promote, chances are they get better and better at their craft. 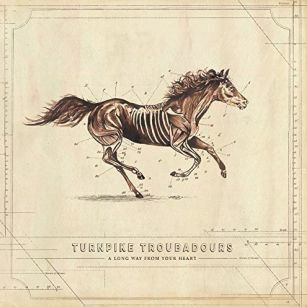 A Long Way to Your Heart, the latest release from Turnpike Troubadours, will deservedly get the ‘favorite album’ kudos. What is a milestone for the Talequah, Oklahoma band is how the sound of their album comes closest to the electricity of their live performances. Sonically, the excitement of the stage translates seamlessly onto A Long Way from Your Heart. The songwriting of the new album is what pushes against past successes from Turnpike Troubadours. A Long Way from Your Heart is a full album listen, the words clearly portraying the feelings and ways of the boys in the band who have become familiar as friends from their constant touring. 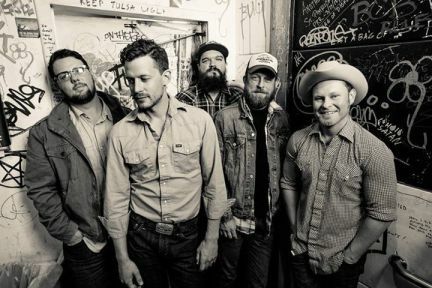 The request that Turnpike Troubadours make in “Something to Hold on To” goes beyond the resume in the words as the guitars and fiddle play tag throughout the tune, making the invitation to ‘give me one last try’ damn near irresistible. The album opens up welcoming an old friend as Lorrie again plays a lead role in a Turnpike Troubadours song after stints in “Good Lord Lorrie” (Goodbye Normal Street) and “The Mercury” (Turnpike Troubadours). A Long Way from Your Heart pounds out a beat as the band keep outrunning problems in “Pipe Bomb Dream” while weather alerts come in between the Country music playing on the radio in “A Tornado Warning”, warnings of the death of Rock’n’Roll are front page news in “Sunday Morning Paper”, and the rattle of a string band serenade plays for “The Winding Stair Mountain Blues”. Turnpike Troubadours strum acoustic guitar chords as they whisper secrets on “Unrung” while appreciating the love that stays true as they circle the globe in “Pay No Rent”, acknowledge the return of a heart speed bump with “Old Time Feeling (Like Before)”, and finally get some rest as they lie on a field of grass counting “Oklahoma Stars”.